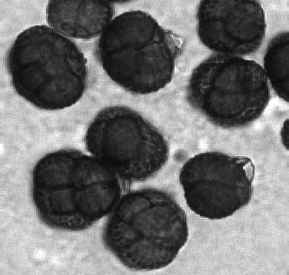 Bioaersols can be collected on filters and analyzed by methods including direct microscopy, growth of propagules directly on the filter medium, elution of particles from the filter, and dilution plating.18 In addition, specialized methods are available for analysis of dust collected on filters for endotoxins, glucans, and mycotoxins, and by PCR. TABLE 3.12. Airborne Endotoxin Upwind and Downwind of Wastewater Treatment Plant"
"Analysis by Limulus assay (see Ref. 61). endotoxins collected by filter cassette in a complaint zone was at least two orders of magnitude greater than that present at outdoor and indoor control sites. As discussed in an earlier section, this suggested that the flulike illness in the complaint zone was associated with endotoxin exposure. Table 3.12 provides an additional example of sampling strategy using filter cassettes where the objective was to determine whether airborne endotoxin from a wastewater treatment plant was degrading the air at a nearby office building. Air samples were collected outdoors in the air around the office building, in the air upwind from the wastewater treatment plant, and in the wastewater treatment plant. Endotoxin concentrations in the outdoor air around the office building were similar to those present upwind of the wastewater plant (Table 3.12). The endotoxin concentration in the wastewater plant was only slightly elevated relative to concentrations in the outdoor air at the office building and upwind of the plant. This sampling data suggested that Gram-negative bacterial aerosols from the wastewater treatment plant were not affecting the outdoor air entering the office facility at the time of sampling. A sampling strategy for b-1,3-d-glucans using filter cassettes is illustrated in Table 3.13. The objective of sampling was to determine the extent of exposure to glucans under the unusual condition where moldy, moisture-impervious wall covering was physically removed from gypsum wallboard (concentration of Penicillium-Aspergillus spores >105/m3)34 as might occur during mold remediation activities. TABLE 3.13. Air Sampling for b-1,3-D-Glucan When Moldy Moisture-Impervious Vinyl Wallcovering Is Removed from Envelope Wall"
Sampling was carried out separately in empty rooms where one sheet of moldy vinyl wall covering was removed and in another room where the wall covering was undisturbed. b-1,3-d-Glucan levels increased by three to four orders of magnitude in rooms where moldy wall covering was peeled back from the wall as compared to indoor and outdoor control locations (Table 3.13; Morey and Rylander, unpublished data).